This weekend, we resume our Fellowship of the Ring read-through in Hall of Fire with Frodo still struggling toward the safety of Rivendell — and still pursued by Sauron’s minions. With a great effort Frodo sat upright and brandished his sword. ‘Go back!’ he cried. ‘Go back to the Land of Mordor, and follow me no more! When Strider finds that the Black Riders have withdrawn from Weathertop he realises their aim must be to let the Morgul Blade turn Frodo to their will. He tells Sam the party must hurry to Rivendell: only Elrond’s skill can fully overcome the blade’s evil enchantment. Luck is with them: Frodo proves resilent against the morgul-wound, the Last Bridge is not held against them, and they chance upon the elf-lord Glorfindel as they make for the Ford of Bruinen. Pursuit is hard on their heels though; Frodo reaches the Ford barely ahead of all nine Ringwraiths. They call for his surrender, and even as Frodo defies them with the last of his will a flood rises and carries the Riders away. Join us this Saturday, March 31 at 6.00pm ET (New York time), when we’ll discuss all this and much more as we continue our Fellowship of the Ring read-through! 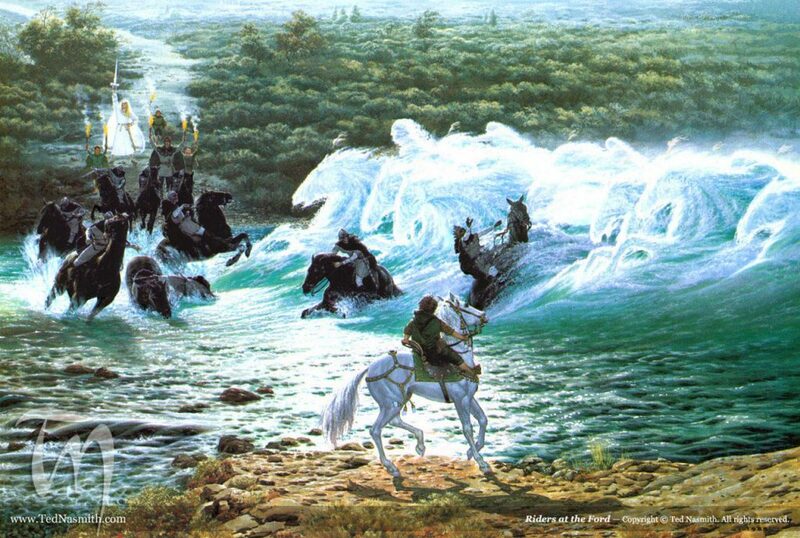 Riders at the Ford by Ted Nasmith.